Column: made out of fabricated steel structure having precision machined guide ways. The apron slides on the guide ways (on anti friction bearings). The vertical drive to the apron is provided by fixed speed AC motor/Gear box, brake (located at the top transmission platform) through chain sprocket drive. There is a counter balancing weight attached to the chain on the other end which slides within the column. Apron: Fabricated/machined structure which slides up / down on the column guide ways. Houses all the anti friction bearing rollers. The boom slides horizontally on the rollers mounted on the apron. Boom: Fabricated steel structure having machined guide ways. The horizontal drive is provided by variable speed drive motor/gearbox & through rack-pinion. Boom Trolley: Fabricated trolley with 4 wheels. This runs on 90lbs/yd rail. The drive to the trolley is provided by fixed speed/ variable speed (as required) motor / gear box. The column/ boom is mounted on the trolley. (Optional). Swivel: An imported slewing ring bearing is fitted at the bottom of the column for 360 degree swivel. In case the swivel is not required, the bearing is not fitted. (Optional). Motorized cross slide:Compound (X-Y) slide mounted on the boom tip. The welding head is mounted on the same. Catwalk & operators platform: Catwalk is provided on the boom. Ensures operators safety. The operators chair facilitated easy operation. Power source trolley: Small trolley connected to the motorized trolley of the boom. 1: It is normally not recommended to provided operator�s chair and catwalk on light duty Column & Booms for reasons of safety and quality. 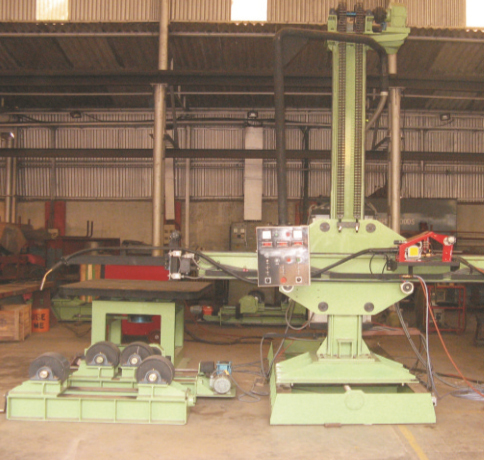 2: Motorized Rotation of Column can be provided at extra cost. 3: Machines Rails and cables up to input of the control panel on the trolley may be arranged by the customer.